You have two options, Freezing Alchemist. Either surrender and live a peaceful life, or die at my hand. 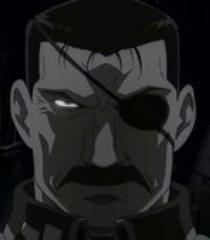 I'm the leader of Amestris! I should deserve some respect, dammit! Edward Elric, you have proved to me that you are two things... Number 1, a headstrong youth with a heart for adventure, and number 2, a little b***h... Therefore, I hereby dub you the Fullmetal Alchemist. Did you see that iceberg crash into town last night? Shhhhhhhhhhhhh, shush my little mustang. Everything will be alright.